I remember when I was growing up in Southern California, known then as the nation’s fruit basket, the markets would have beautiful fresh fruit year round. But most of it was grown within a few hundred miles and so it was picked within days of being sold. So the available selection followed the seasons. Berries and Valencia oranges early in the year, followed by apricots, peaches, plums, avocados, apples, Naval oranges and melons in the fall. Obviously, the tropical fruit like bananas and pineapples had to be imported. Now, if you go into your local supermarket you can find nearly every type of produce year round as cold storage and foreign grown have greatly expanded the selection of not just fruits but vegetables as well. But is that a good thing? Just bite into a pear that looks beautiful on the outside but is mushy or mealy when you take a bite and you know it has been sitting in cold storage. Even when you can find domestically grown avocados, they are often hard as a rock and need a week or more at home before they can be eaten. Vegetables from foreign countries are often grown without the bothersome regulations that our farmers are subject to in this country. In our travels to South American farms, we’ve noticed poor sanitation and polluted water in the fields. To improve the quality and freshness of our fruits and vegetables we have gone back to buying fruit in season that is grown in this country and, preferably, within a couple of hundred miles of our home. We have also grown some of our own food in raised beds, in the garden, and in Earth Boxes on the patio. We also occasionally visit farmer’s markets or farm stands in the summer. But perhaps my favorite alternative source for fresh vegetables is a farm share we purchase each summer. 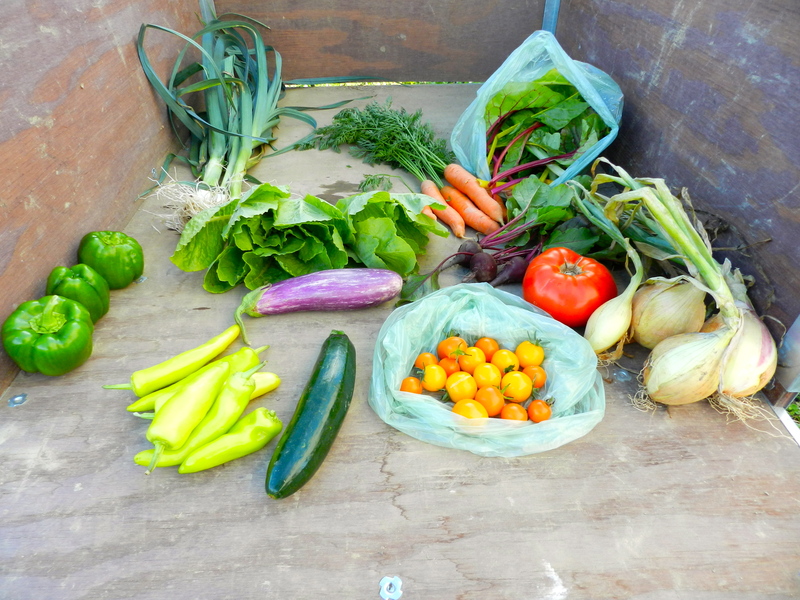 For a couple of hundred dollars, we receive a one half share of the weekly harvest grown on a farm run by agriculture students from the university a few miles from our home. The season here in Maine runs from mid-June to late September or early October. We get lots of variety and we plan our menus around what we receive each week. The food is healthier and we are supporting farmers in our own communities. It is definitely a win-win situation. This entry was tagged Community-supported agriculture, Fruit, health, Maine, Produce, Southern California, Vegetable. Bookmark the permalink. Seasonal produce is such a different way of eating for so many of us but it has so many benefits.